Pet rabbits should always have access to fresh water. On a daily basis, rabbits consume between 25 and 75 milliliters of water per pound of body weight. Rabbits will do OK during cold weather as long as you've prepared their habitat properly and you ensure their water supply doesn't freeze. Serious health complications can occur if a rabbit goes without water for more than 24 hours. The right type of water spout on your rabbit's water bottle may mean the difference between a healthy, hydrated pet and a thirsty bunny. Two types of spout are available: A metal type that contains a ball that releases water when the rabbit licks it, or a sippy spout that doesn't drip. Though rabbits will readily drink from either type, the metal spout may freeze in winter temperatures, according to the Rise and Shine Rabbitry website. Bottles with sippy spouts are more costly but are durable. When purchasing plastic bottles, choose soft, opaque plastic that won't shatter when it's cold outside. You can make a bottle insulator by wrapping bubble wrap around the bottle and fitting a thermal sock over that, keeping water at a drinkable temperature, according to the website The Rabbit House. Bottle insulators are also commercially available and fit conveniently over the bottles. In a pinch, you can use a warm glove instead. If none of these is available, a used plant pot secured to the inside of the hutch can house the bottle, keeping it somewhat insulated. When temperatures plummet, it's a good idea to keep extra water bottles at hand, in the event that the bottle the rabbit drinks from freezes, the Alabama Cooperative Extension Service advises. When freezing conditions render your bunnies' bottle unusable, quickly switch bottles. Continue cycling in room-temperature bottles as long as needed. Rabbits should go no longer than 8 hours without water, but if extra bottles aren't available, you can bring the existing bottle indoors for a short time to thaw. 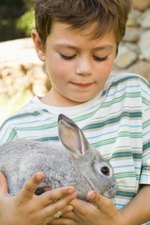 Responsible rabbit owners ensure that their pets' outdoor enclosures are adequate shelter for their fluffy inhabitants. Proper winter shelter for domestic rabbits should be constructed so that the rabbit is sheltered from the north wind. While good ventilation is important in keeping rabbits healthy, a plastic sheet secured to the hutch can help insulate it and keep rabbits the healthy over the cold months. A well-insulated hutch is the key to keeping outdoor rabbits cozy and preventing their water bottles from freezing, according to the Rabbit Welfare and Association Fund.